American in the Roaring Twenties. Vaudeville was king. Talking pictures were only a distant flicker. Speakeasies beckoned beyond dimly lit doorways; money flowed fast and free. But then, almost overnight, the Great Depression leveled everything. When the dust settled, Americans were primed for a star who could distract them from grim reality and excite them in new, unexpected ways. Enter Gypsy Rose Lee, a strutting, bawdy, erudite stripper who possessed a preternatural gift for delivering exactly what America needed. With her superb narrative skills and eye for compelling detail, Karen Abbott brings to dramatic life an era of ambition, glamour, struggle, and survival. Using exclusive interviews and never-before-published material, she vividly delves into Gypsy's world, including her intensely dramatic triangle relationship with her sister, actress June Havoc, and their formidable mother, Rose, a petite but ferocious woman who seduced men and women alike and literally killed to get her daughters on the stage. 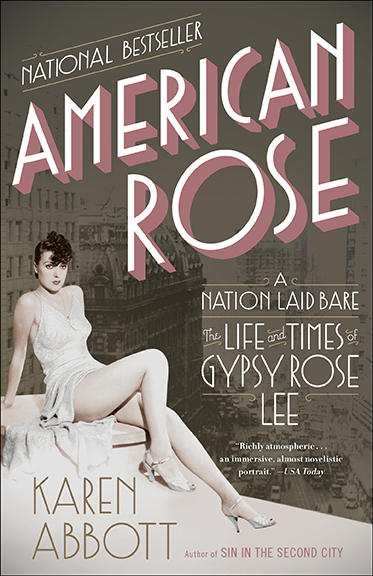 American Rose chronicles their story, as well as the story of the four scrappy and savvy showbiz brothers from New York City who would pave the way for Gypsy Rose Lee's brand of burlesque. Modeling their shows after the glitzy, daring revues staged in the theaters of Paris, the Minsky brothers relied on grit, determination, and a few tricks that fell just outside the law—and they would shape, and ultimately transform, the landscape of American entertainment. With a supporting cast of such Jazz-Age and Depression-era heavyweights as Lucky Luciano, Harry Houdini, FDR and Fanny Brice, Abbott weaves a rich narrative of a woman who defied all odds to become a legend—and whose sensational tale of tragedy and triumph embodies the American dream.